The things that can distract a driver’s attention are innumerable, from crying children to a spilled soda. 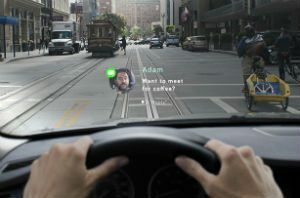 Navdy, a San Francisco-based hardware and software maker, believes its windshield display technology is the innovation that can cure the latest plague attacking driver safety: smartphones, with their notifications that are constantly tempting owners to answer while driving. The company’s device connects to a user’s smartphone and automobile, and projects information, such as alerts about incoming calls or diagnostics from the vehicle, in front on the driver in a transparent display. Automakers have for years been selling devices like this, called heads-up displays. Japanese electronics giant Panasonic has one of its own, which it markets as a safety feature, as does autoparts maker Continental AG. Those displays, along with ones being developed by carmakers from GM to BMW, have typically focused on offering information about the vehicle or road conditions. There’s even a company, Nuviz, that ran a successful Kickstarter campaign for a motorcycle helmet heads-up display. Navdy’s founder, Doug Simpson, readily admits that there are competitors, noting that 4 million car windshield displays were sold from 2010 to 2013. Yet, he says, existing devices don’t resolve the problem of smartphones distracting drivers. Navdy does, Simpson says, because a driver can use the phone by controlling the Navdy system with voice commands and hand gestures, instead of by touching the phone. Consumers seem to be buying in. The company has accepted more than $6 million worth of preorders for about 17,000 devices. That caused two things to happen, Simpson says. First, because the company only expected some $1 million of preorders, it had to delay its planned release of the device from the start of 2015, until later this year as it aligns to meet demand. The company hasn’t released the exact release date. The surge of orders also drove venture capital to the company. Navdy announced a $20 million Series A funding round yesterday, $5 million more than Simpson was targeting. The round was led by Upfront Ventures, with participation from others that included Formation8, Qualcomm Ventures, Promus Ventures, Ludlow Ventures, and Wareness.io. The funding gave Navdy a valuation that has been reported as between $80 million and $100 million, estimates that Simpson says are “in the ballpark.” Navdy took in $6.5 million of seed funding in August. Joel Feldman, the founder of End Distracted Driving, is concerned that companies such as Navdy do not have enough scientific evidence to prove heads-up displays are less distracting than cell phones. Citing a study by the University of Utah, Feldman says drivers still have difficulty reacting while using hands-free devices, particularly when needing to perceive and adapt to changing roadway conditions. Clearly, Simpson believes Navdy is safe. The device keeps a driver’s attention on the road, Simpson says, even if he or she is peripherally looking at the display information. Plus, the display appears as if it is several feet off in the distance, past the windshield and in the road, keeping a driver’s attention there, he says. An additional reason for delaying the launch was to ensure the company had worked through problems such as determining how much information a driver can process without making the driving less safe, Simpson says. Navdy complies with National Highway Traffic Safety Administration guidelines, Simpson says. If those regulations change to reflect the increased use of devices like Navdy, his company can alter the software or hardware to comply, he says. Car makers have started contacting Navdy about potentially working together. The company has also begun talks with insurance companies about its system, though it has nothing to announce yet, Simpson says. He declined to provide further details about what the talks involved. Navdy, which was founded in 2012 and participated in PCH International’s Highway1 hardware accelerator program in 2013, plans to use the Series A funding to finish prepping its commercial capabilities and to make new hires, particularly of engineers and other technical staff. It has 20 employees, and may grow to as many as 45 this year, Simpson says.